Have you been busy lately with family and work and Pilates has taken a back seat. But it’s been on your mind again as you feel stiff, have lower back pain and maybe you are visiting a physio again. Only you know why you stopped doing Pilates regularly but take a few moments to reflect on why you did. How did your back feel when you were doing Pilates? Did you use Pilates as part of another sport? Once you have decided that you are going to get back into Pilates, you need to set yourself up so that achieve what you set out to do! Set yourself a goal and make sure it a SMART goal. 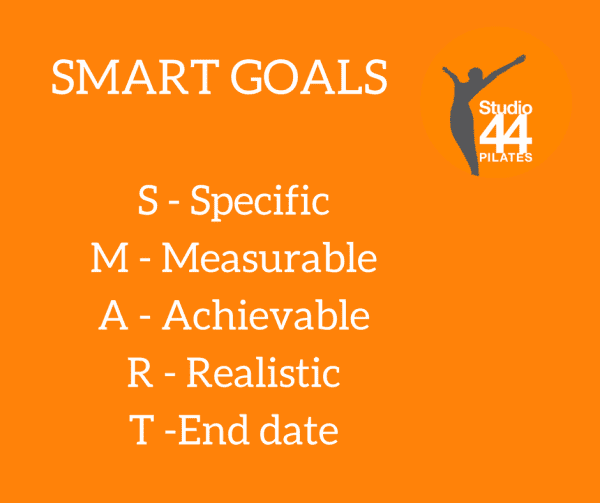 This blog explains how to set up a SMART goal. Decided whether you can commit to a class each week or whether you are going to try Pilates at home. If a weekly class then you just need to make sure that you take the time out to turn up each week. If you are doing at home then you also need to plan your time. My blog “5 tops tips to do Pilates sessions at home” will help you plan. Setting your goal you would have decided how many times a week you are going to do Pilates and for how long! This needs to be planned into your diary each week. Don’t be afraid to fail, life gets in the way, but don’t let it stop you the next day, just carry on and don’t beat yourself up about it! If you are going to do your Pilates at home, decide between finding free sessions on YouTube or add more commitment to your home practice by signing up to an Online Pilates membership. Like a class you don’t want to waste money and it might motivate you to turn up each time you have planned to do your Pilates. 5 Pilates exercises to get your Pilates Mojo back! Still not sure if Pilates at home will work for you? Then give these 5 exercises a try at home. Do each exercise 10 times and try a couple of times this week. This is a strength exercise and great for getting the blood following around the body and getting you to focus on breath and movement. This is great for mobilising your spine as well as strengthening your glutes. This is a great stretch with rotation to keep your body moving. A great exercise to take you into extension especially if you sit all day. This is great for massaging your spine, it’s a bit of fun too but also done properly does use the core. If you have enjoyed doing these exercises this week that’s great and you have shown a commitment. But you need to vary each session, to keep you motivated but also to keep your body challenged. My 10 minute Pilates online membership for busy people might be the perfect solution to get your Pilates mojo back.